To promote the benefits of self-sufficiency by encouraging people to become more self-reliant and resourceful and less dependent upon ‘consumerism’ (mass production, commercialism and profits). Not only does this new found independence promote a more natural and healthy lifestyle but it also offers more affordable ways of living for both planet and people. To encourage environmental awareness in day-to-day living – for the sake of our precious planet. To rekindle basic survival skills – much of which have been lost amid the ‘rush’ for progress – and to restore a sense of security and control over our lives and financial circumstances. 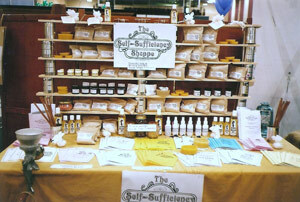 Discourage self-motivated profit-making – The Self-Sufficiency Shoppe does not put ‘profit & progress before the planet’. It endeavours to change people’s attitudes and bring back what has been lost through ‘consumerism and commercialism’ in a hope that planetary balance is re-established. Its publications and products are not like commercial items. The Shoppe’s products are aimed at developing and encouraging consumer independence from commercialism– not consumer dependence. Products are environmentally responsible. Packaging and presentation is kept to a minimum. Recycling is encouraged and practiced. Typical advertising and consumer ‘tactics’ are avoided – where the customer is manipulated through clever and emotionally focused advertising. Responsibility and loyalty to the planet is foremost – nothing else matters. What is the point of individual acquisition of wealth when the very basis for human survival – the planet – is rapidly deteriorating? On creating the concept of The Self-Sufficiency Shoppe ‘practicality’ has been the key-word in every way. The Shoppe is not about selling commercial products and flooding, even further, the commercial market, but about encouraging each individual to use simple environmentally friendly alternatives. It is about stepping out of the world of ‘commercialism’ into a world of freedom of choice, creativity and control over what is used and consumed.